Most people have experienced the cycle of weight loss and weight gain. The hardest part can be maintaining long term weight loss. Long-term weight loss maintenance studies do not always make for positive reading. Approximately 10-20% of subjects are able to maintain a weight loss of at least 5% after 5 years. 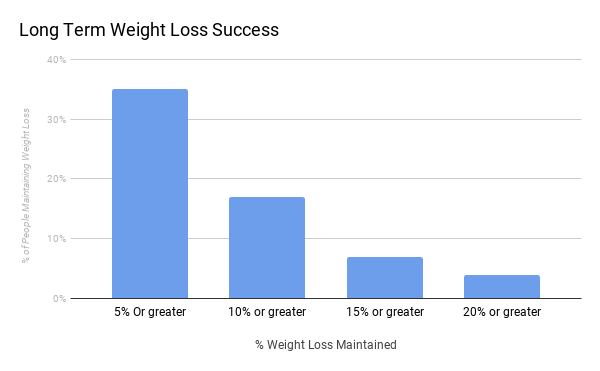 The findings of other research also suggests a less positive outcome; five years after completing structured weight loss programs, people only maintain a 3% weight loss. High protein is very important for dietary adherence as it helps you to stay full. Protein is the most satiating macronutrient, followed by carbs and then fats. Fibre is often overlooked when seeking weight loss, but it’s essential for gut health and slowing down the absorption of food, keeping you fuller for longer. A general rule for fibre is 10-15 grams for every 1000 calories consumed. Hydration is also often overlooked, the reality is that when people think they are hungry, they are actually dehydrated. Staying hydrated will help you reduce the feeling of hunger and therefore less likely to deviate from the diet. Reduce variety – Often when you have more choice you eat more. An easy way to reduce overeating is to reduce variety, you have less choice and therefore less likely to overindulge. An example of this is at a buffet, when you are faced with multiple options, you naturally want to try them all which increases the risk of overeating, ‘Buffet Effect’. On average, an additional 50-60 kcal/d for each additional food offered, if at least 5 different foods are available. Add Barriers- Don’t buy it, lock it away (vending machine study). If the food is in view, you are more likely to consume. If you didn’t have the food in the house in the first instance, you are less likely to drive to the shop and buy it. Why Is Dietary Adherence So Difficult and How To Overcome It? In regard to food and adhering to a diet, there are numerous physiological, psychological and environmental barriers that need to be considered. First of all, let’s look at physiological barriers. When dieting we can be aggressive or cautious depending on your goal. 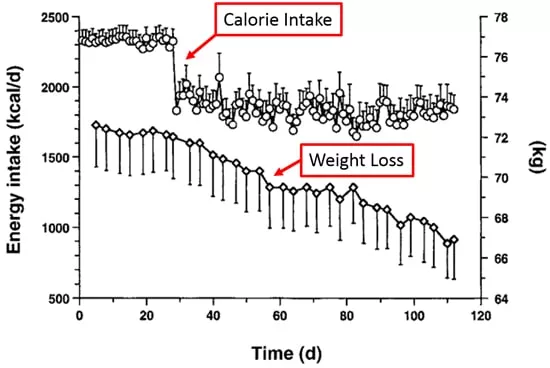 Initially you will achieve greater weight loss with a greater calorie deficit (30%) but at the expense of increased hunger levels which can lead to reduced adherence and slower weight loss (you push yourself too hard and end up consuming more calories). Reducing palatability/reward and therefore the variety of food available will automatically reduce the risk of overeating. This doesn’t mean needing to start following a ‘bro diet’ of chicken and broccoli, but simply reducing your food choice. This will also help you achieve more structure and consistency to your diet, therefore having more control of your calorie intake. Chris Voigt took this to the extreme by only eating potatoes and a small amount of cooking oil for 60 days and lost 21 pounds without trying, without the feeling of being hungry and consciously trying to reduce calories. Or better still, don’t buy ‘problem’ foods in the first place, if it’s not in the house, you can’t eat it. The reality is that the majority of us know how to lose weight, it’s just having the mindset to do so. Learning about nutrition and finding out what ‘diet’ works best for you is pretty useless if there are certain behavioural patterns that prevent you from executing the diet 100%. As soon as you can establish your behaviours and why you eat the way you do e.g. binging, you can then start to work on implementing strategies to help you improve adherence. How are you getting on with your current diet? Are you able to adhere to it? These are the questions that you need to ask yourself because if you answered no to the first 2 then you will not be in adherent in the long term. 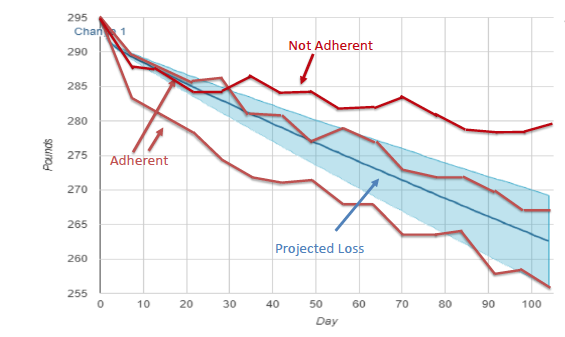 The following graph shows a strong correlation between being adherent and the projected weight loss, meaning if you adhere to the diet, you will lose weight. When you stop being adherent, that’s when weight loss starts to slow down and level out which the graph illustrates. The success of a diet in the short term is a great indicator of long-term weight loss. Avoid situations that you know that will invite temptation e.g. buffets. Why make things difficult for yourself? If you remove the temptation then you are less likely to relapse. Practice mindful eating. Being aware of what you are eating can help you make an informed decision and acknowledge your food choices. It’s too easy to snack and not even realise you’ve just consumed 1000 calories, but in your mind, you’ve only had a small snack. Accountability as part of your weight loss journey will help you focus on keeping to the plan as you won’t only be letting yourself down, but other people. Create a consistent routine and good habits will mean you will do what is needed in order to make progress more consistently without consciously having to think about it. Examples of this would be consuming a high protein breakfast, walking 10,000 steps a day and going to the gym 3 times a week. The ability to manage hunger and low energy will be key if you are going to adhere to the diet. Losing weight means you will be a in a calorie deficit so there will probably be times when you will feel hungry. There are a few things you can do to help, including low calorie/high volume foods, calorie-free drinks, staying hydrated and spreading your meals throughout the day. Self -monitoring correlates positively with adherence. For example, getting into a routine of tracking your weight, doing monthly before/after pictures, tracking calories and tracking workout will help you to focus on achieving your goal. A supportive and stable environment is important for long-term weight loss. Losing weight can be challenging at times, the support of people around you can have a significant impact by affording encouragement needed to manage the more difficult times. Motivation is worth little without a specific plan in place. Create short-term goals for yourself, for example 10,000 steps daily, 1 pound weight loss a week, hitting your daily calorie goals. You are more likely to implement positive behavioural changes if you have goals to focus on.